Edwin C. Prior was born in Newshoram, Newport County, RI. October 15: The Buffalo Daily Republic, Buffalo, NY. January 22: New-York Tribune, New York City, NY. 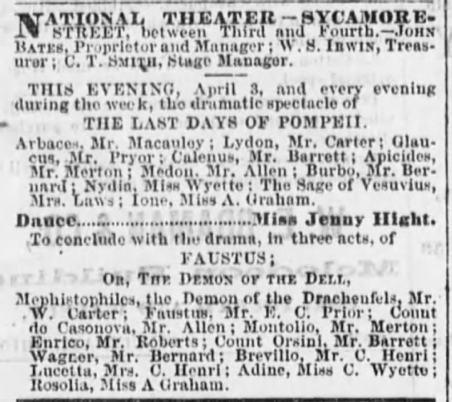 April 3: Cincinnati Daily Press, Cincinnati, OH. November 5: Chicago Tribune, Chicago, IL. November 7: Chicago Tribune, Chicago, IL. The Chicago City Directory showed Edwin Prior as an actor at McVicker’s. Edwin Prior would have been quite familiar with fellow actors, Edwin and John Wilkes Booth. Edwin Booth was married to the daughter of the James Hubert McVicker, the theater owner. January 22: Chicago Tribune, Chicago, IL. July 16: Edwin enlisted in the U.S. Army in Chicago, IL. His description was as follows. Age: 35, Height: 5’10, Hair: dark, Eyes: dark, Occupation: actor, Marital Status: married. July 30: E.C. Prior was mentioned in a recruiting article regarding the 72nd IL. Chicago Tribune, Chicago, IL. December: Edwin was posted in Vicksburg, MS.
February 26: Wartime Journal of Frank L. Church. June 28: The Vicksburg Herald, Vicksburg, Mississippi. November 30: Edwin was mortally wounded in the Battle of Franklin. He didn’t die until December 18th. December 16: The Vicksburg Herald, Vicksburg, MS.